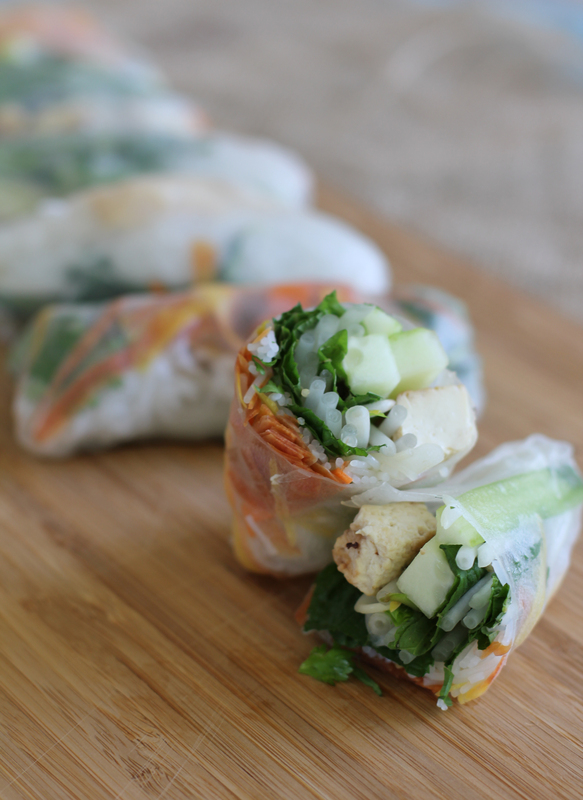 Vietnamese fresh spring rolls are one of my favorite summer foods to make, and they are healthy, vegan, and gluten free! Occasionally we get together with family and have “spring roll making day” where everyone makes springs rolls for lunch or dinner and eats them. 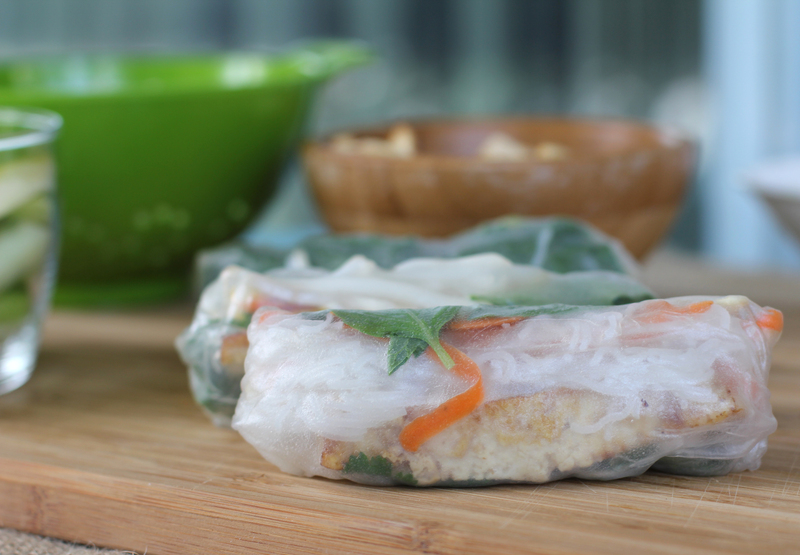 They’re like the little Asian version of burritos filled with healthy goodness! Here’s how I made mine. First, prep all of the ingredients. Wash all of the herbs and vegetables and peel the carrots and cucumber with a vegetable peeler. Then either julienne the carrots or use your shredder to shred into small pieces. Cut your cucumber into long slices that will fit into a spring roll. Set aside. 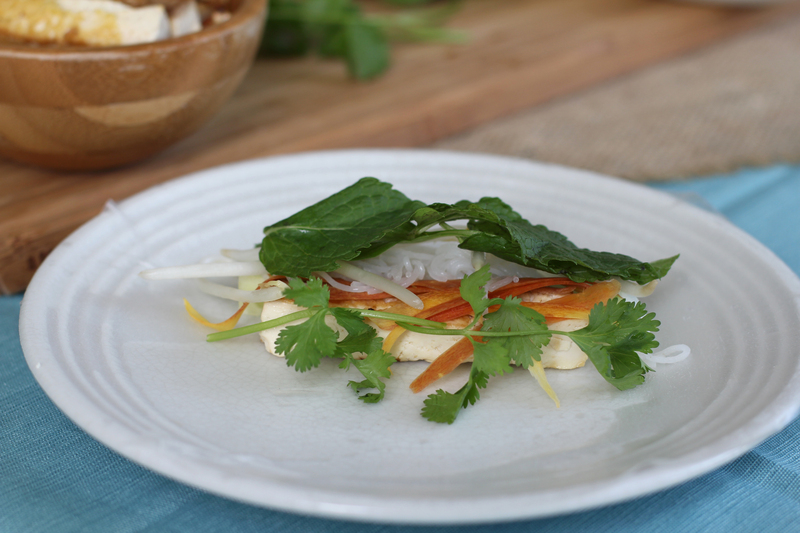 Peel the leaves off of the mint and basil and break the cilantro into smaller pieces. Set aside. Boil the rice noodles in water according to package. Usually I heat up a pot of water to a rolling boil, then drop the noodles in for about 3-5 minutes. Take the noodles out and drain the water. Set aside. Mix the sesame oil and soy sauce together in a small bowl. Cut your tofu into long cubes and marinate in the mixture for a few minutes. Heat a pan to medium heat and grill the tofu, flipping to make sure both sides get grilled. Remove from pan and set aside. 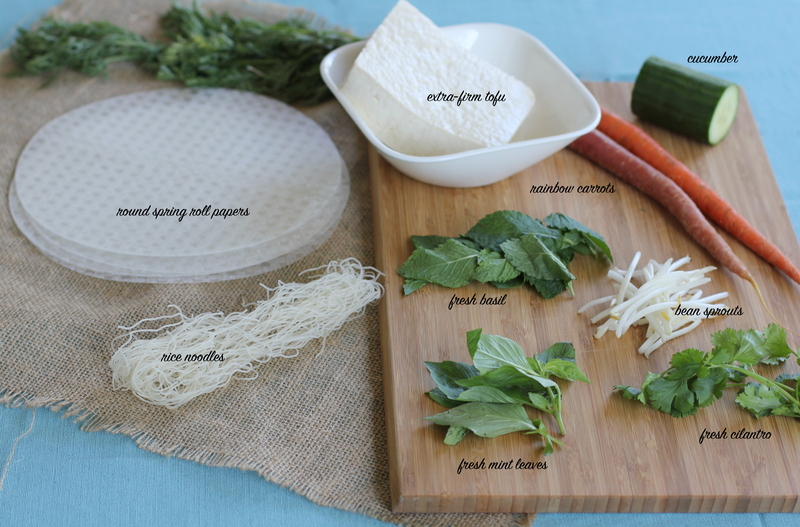 Now you are ready to arrange your ingredients in the spring roll paper! First, heat some water. I use my home kettle, then pour the water into a bowl large enough to fit one of the round spring roll papers. 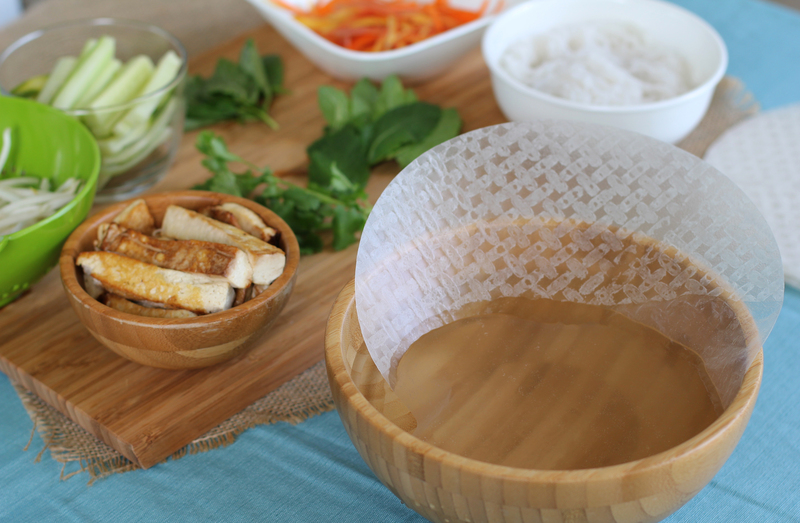 Dip your spring roll paper into the water quickly, then place onto a plate. Be sure not to take too long, otherwise it will get flimsy and start sticking to itself. I usually rotate it in the bowl quickly and then put it on a plate. 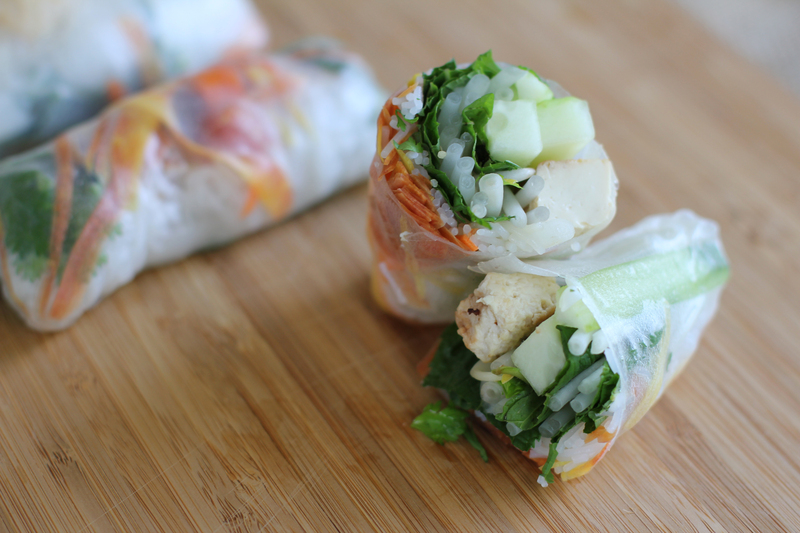 Arrange all of your prepared ingredients in the center of the spring roll paper. Now you are ready to fold! I typically fold in the sides and then roll it, like you would a burrito. I know that other people have different ways of doing this, and it all depends on what is easiest for you! 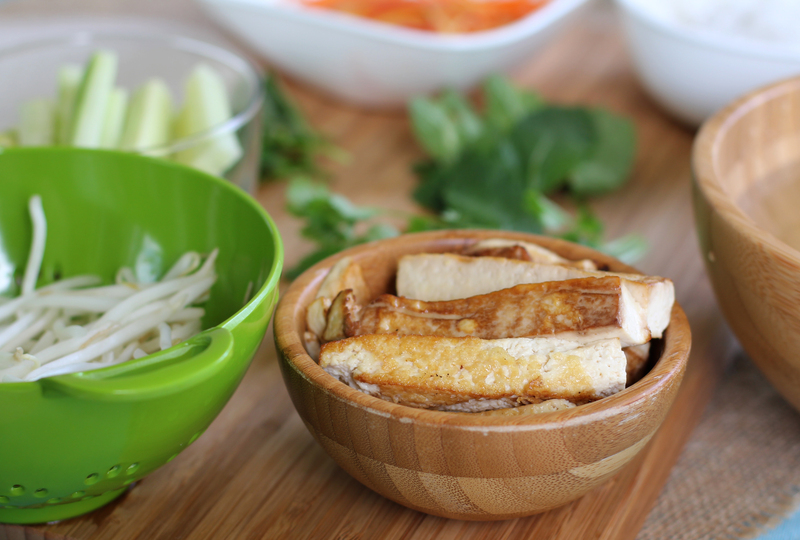 And there you have it, healthy fresh Vietnamese tofu spring rolls! Have you tried this recipe or have a recommendation for one? I love recipe shares, so feel free to share in the comments below! Did you take those picture yourself? If so, awesome job! Looks very professional… and what camera do you use?